Weather is a story in progress. Posts are added periodically, covering a variety of weather related topics and more. 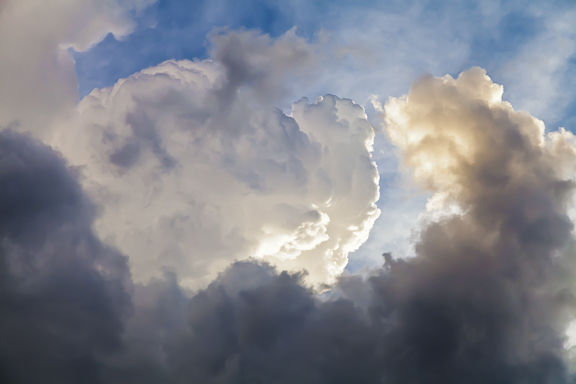 Read the blog to learn about weather events, weather forecasting, and the science of meteorology. The blog is designed to appeal to the general public. 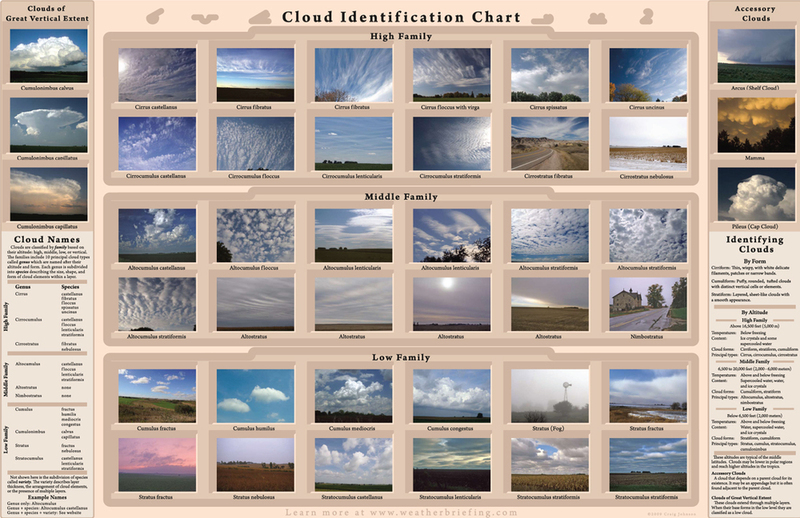 Our online store currently offers the Weather Briefing Cloud Identification Chart and Cloud Collection Note Cards. We also offer free digital products for download that include weather observation forms and plotting maps at no charge. Look for weather instrumentation in the future. The Weather Briefing online Cloud Atlas includes images of cloud types recognized by the World Meteorological Organization. Use the atlas to identify clouds based on their form, shape, and texture. The Atlas is under construction. The Station Model Plot is the standard format for displaying observations on weather maps. The plot arranges weather data into a grouping around each weather station location. Learn how to decode surface observations by clicking on the link below. You can practice reading the plots on weather maps that include plotted data. You may practice decoding the surface plot format by clicking on the button below and scrolling down the page. Upper air station plots use a similar but not identical format. The upper air format will be added in the near future. Most surface maps found on the internet today use a modified plotting format that does not use all of the observation data. With the advent of automatic weather stations some of the data, such as cloud types, are no longer available. Typically, temperature, dew point, pressure, cloud coverage, current weather, wind direction and wind speed are included. By becoming familiar with the complete standard plot you will be able recognize what data is missing. If you scroll up this page and view the background graphic behind the title you will see station model plots on a weather map published in the 1960s. The plots include, going counter-clockwise from the upper left of the station circle; temperature, dew point, pressure tendency, pressure, and cloud type. The cloud coverage is found inside the station circle and the wind direction and speed is shown using a line and “flag” extending from the circle. The following links provide worldwide weather information from a variety NOAA/NWS, international, and other weather sources. The information ranges from public forecasts and discussions to technical data used by professionals. National and International Weather Portals: USA, Canada, and worldwide weather forecasts and much more! 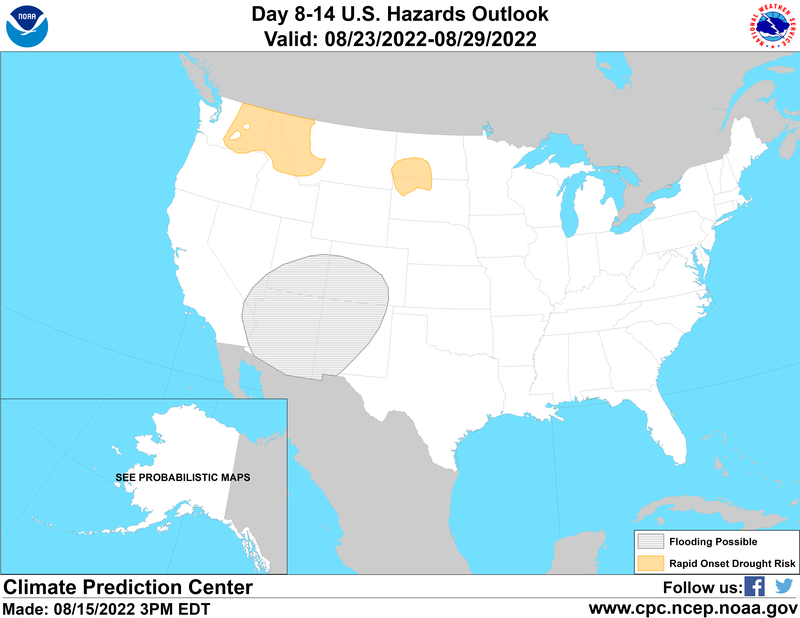 Forecasts: Mid-range and long-range outlooks. Maps: A variety of plotted, analyzed and unanalyzed weather maps. Forecast Guidance: Forecast center websites, forecast maps, and weather forecast computer model output. Climate Product and Data: Long-range outlooks and archived data. Education and News: General information, articles, news, and miscellaneous information. Browse each category and explore the information. Many links within a category lead to other weather information sources . For example, the weather portals point to far more than weather forecasts. Basic data, imagery, and maps are also available. Look for these options to find additional products. The links below are provided for educational purposes only. Weather Briefing L.C. has no control over the content provided by the websites and makes no guarantee regarding the timeliness or accuracy of the data. The user is solely responsible for how the information is used. Links under “What’s New Here” will eventually move to one of the categories below. From NASA’s EPIC camera comes a full year in the life of Earth as time-lapsed from the NASA DISCOVR Satellite. The view is from 1 million miles away. Weather is global. The free exchange of weather data between most countries requires using a time standard that does not change - the time must be the same everywhere and it must not include daylight saving time. Today we use UTC, also known as Coordinated Universal Time. All nations coordinate their weather data gathering schedules using the same clock. While local times are different, world time is the same everywhere. Learn about time and UTC by clicking below. CoCoRaHS is an acronym for the Community Collaborative Rain, Hail and Snow Network. CoCoRaHS is a unique, non-profit, community-based network of volunteers of all ages and backgrounds working together to measure and map precipitation (rain, hail and snow). By using low-cost measurement tools, stressing training and education, and utilizing an interactive Web-site, the aim of CoCoRaHS is to provide the highest quality data for natural resource, education and research applications. CoCoRaHS now in all fifty states and Canada.